If you love cats and are on Twitter, you're probably following @Sockington, a black and white rescue cat who has nearly 1.5 million followers. But who else should you follow? Here are 20 tweeters involved in the cat world--from fundraising kitties to pet bloggers--who are sure to delight ailurophiles. I've listed them in no particular order... but they all deserve a big bowl of nom-noms and a catnip mouse. @CATeditor is the editor of the award-winning Cat Fancy magazine. @CATeditor tweets essential cat issues, feline health, fun kitty products and more. @CatChatCaren is a fun and generous tweeter with a popular pet blog Cat Chat with Caren & Cody. She is very active in the cat blogosphere and shares the "best of the best" cat-centric news. Her kitty Cody is her wry sidekick. The 24/7 queen of kitty pop culture! @Catsparella has got her paw on everything cat. All the latest and greatest in the cat world--including feline fashion, food, kitty news and interviews, music, TV, and the obscure! @Brian106sc is a force to be reckoned with in the animal rescue world. Brian, a tabby cat, with 5 sisters has a mission: "adopt cats, we deserve it." He is the voice for cats and other animals who are seeking their forever homes. Brian's tweets save lives. @CatFoodBreath is a 17-pound Siamese cat with a sushi habit. Cat Food Breath tweets smart advice on everything from dieting and napping to getting rid of the dog. @Consciouscats tweets on conscious living, health and happiness for cats and their humans. Ingrid King is the author of Buckley's Story: Lessons from a Feline Master Teacher and publisher of the popular blog The Conscious Cat. Get your daily dose of cute! @YourDailyCute tweets the most adorable kitty videos, paws down. Can you say, Awww! @Hauteornotpets tweets the HAUTEST cat (and dog!) products out there. It's the premier online resource for the best pet products on the market! Plus Haute or Not...Pets administers the prestigious Horn Pets Approved seal for the hautest of the hautest pet products. 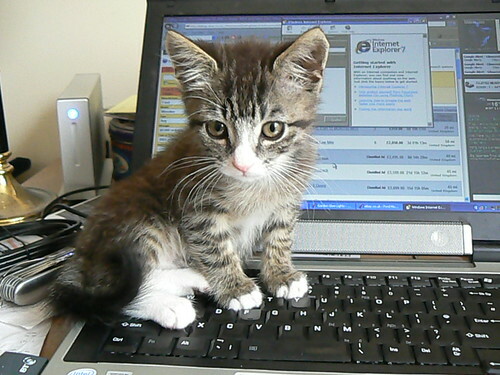 @Catster is the place for all things cat--health, behavior, pictures, news, interviews and more! You'll find a community of cat lovers here! @Petfinder speaks for homeless cats, dogs and other animals seeking adoption. Petfinder has helped more than 17 million pets find homes! Single with cats? You'll find a like-minded community @IHaveCat... and maybe even love... if not the 2-legged kind how about the fluffy and reliable 4-legged kind. @Moderncat tweets the chicest kitty accessories, furniture, art and other trend-setting finds for the stylish cat. @CatTipper tweets the best cat tips, reviews and weekly giveaways. Cat lovers will want to submit their kitty photos to Cat Tipper's Cat of the Day! From the folks who bring you DogTipper. @kittycommittee follows the daily lives of foster kittens from the Tacoma/Pierce County Humane Society and resident cat Charlene Butterbean. Talk about cute! @RomeotheCat is a fundraising marvel. The two-time rescue kitty raised 50K for animal rescues since 2/09! Romeo the cat has his own popular blog, Romeo the Cat. The ultimate destination for all cat lovers. @zootoo tweets pet pictures, videos, trends and reviews. @PeoplePets tweets celebrity pets, like Snooki's cat, Rocky; world's cutest pet contests and animal news. @catladyland admits she like silly stuff. And she has a great sense of humor regarding her 3 furballs: Sassy, Cosmo and Phoebe. @tinypearlcat @mariodacat @ShaynaCat and all the wonderful cats and anipals on Twitter who raise significant money for animal shelters with their pawparties. Purrs to all! @PawsandEffect offers kitty advice by cats—Siouxsie Mew, Thomas T. Bombadil and Dahlia P. Kittenface — with some help from their mama, JaneA Kelley. And I'm on twitter too @careers4yourcat if you want your freeloading feline to get a job! It's time for your cat to move from the couch to the boardroom! I know I probably forgot someone. So please leave your favs in the comments! If you liked this post, see 12 Vets and Clinics All Pet Lovers Should Follow on Twitter. I also plan in the future to feature cat behaviorists who are on Twitter. Thanks for including Your Daily Cute on the list! What a great bunch of people here. Love them all! Oh WOW!!! I am HONORED, FLATTERED and THRILLED to be part of a list of people that I hold in such high esteem! BTW this was an incredibly clever idea! Thank you so much for including me, I too am honored to be included in such great company! I so appreciate the kind words, but we all make a difference only when we do it together!!! WOW! Thanks sooo much for including me! So honored Ann! Great idea for a post and even met a few new pet folks along the way! SEE YOU SOON! I assure you I am not biased, but #5 is the best. #5 is definitely the best, paws down. Yay, I gotta catch up with the ones I don't have!! Catfoodbreath is the best! So funny. Awesome!! Thank you so much for including me in this fantastic group!! Nice list and I am following most of them already but you left off RabidRantingCat!! Thanks for sharing this great list! Now I have to get moving to follow them. Thanks for stopping by my blog! I had a lot a fun at BlogPaws and loved meeting everyone. I was sorry I had to leave early, but was happy to be there as long as I could. OH MY CAT! If this list had been the top 21 cats it would have been us FOR SURE. Who is this author and whare does he sleep. I've got some under the bed peeing and tootsie roll leavin' to do!! !